The City of Toronto has issued an extreme cold weather alert as temperatures are expected to a plunge to a low of -16 Celsius Sunday night with a major snowstorm in the offing within the next two days. “Extreme cold weather alert in effect. Bundle up Toronto!” Mayor Rob Ford tweeted Sunday morning. Environment Canada issued a special statement Sunday predicting 20 to 30 centimetres of snow to drop in southern Ontario, starting Monday night or early Tuesday. “It’s possible it could be the most snow we’ve seen in a storm so far this year, at least for regions outside the snowbelt,” Environment Canada meteorologist Ria Alsen told The Canadian Press. Heavy snow is expected to hit Tuesday night before tapering off Wednesday afternoon. Light snow could start Monday evening. The storm is expected to affect a large portion of Ontario – from Windsor to Barrie to Cornwall. Temperatures are expected to be colder than normal for the next few days. Toronto’s cold weather alert adds extra support services for those in need of shelter. When an extreme cold alert is issued, street outreach workers try to convince homeless people to go inside and provide them with access to shelter. Transit tokens are also provided to help homeless people get to shelters. The city says an additional 171 shelter spaces are added during a cold weather alert. Shelters also relax service restrictions they may have in place. 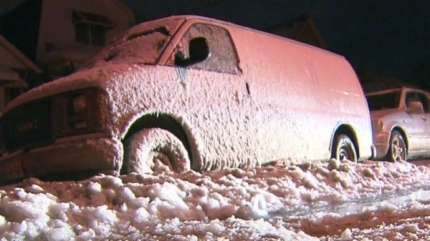 The extreme cold weather alerts are called when Environment Canada predicts a temperature of -15 C without wind chill, or predicts extreme weather conditions such as a blizzard.